The first post was written two months after I started training. It's now been about 7 months. The time the post was written ended up being somewhat unfortunate, because I almost immediately had to deload some of my lifts. My squat form was slightly subpar, and I deloaded the row and the bench press as part of the program: if you can't progress three times straight, you deload. Some form tweaks were also applied. Here's what total progress looks like. The screencap in last post was taken around the 19th of May. You can see dips for the previously mentionned lifts in between the 11 May and 22 June bars. 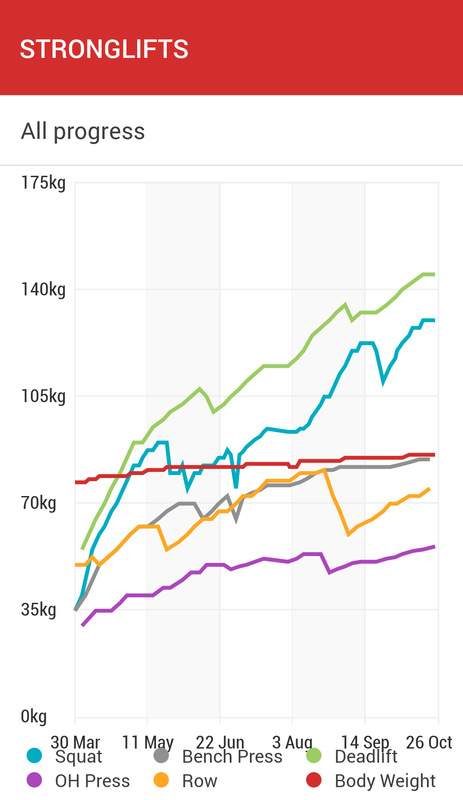 You should ignore the sharp dips right after the 22 June bar — that's an anomaly that occured because I changed the weights one day to make up for having only one hour to spend at the gym. Something interesting is the huge barbell row dip. In short, I was doing barbell row completely wrong. Part of the problem is my size: for proper form (back horizontal) I'm forced to almost press my stomach to my tights, which I wasnt doing. It's also possible that lack of strength in my upper back caused other muscles to compensate. Anyway, I finally feel like I "get" the exercise and I can feel its effects, whereas previously it seemed pointless, too easy, and the form was hard to judge. All other dips in the graph are simply the normal "deload on failure" mechanism kicking in. I particularly remember the squat one towards the end, which occurred after I came back from my Ireland trip. This is one way to know if it’s time to switch from 5×5 to 3×5. If your workouts are taking two hours because you have to rest 10mins between sets to get 5×5… you’re probably overdoing it. Don’t get stubborn about sticking with 5×5. Switch to 3×5 so you can continue to make progress. I only ever did 3-4 mins rests between sets (and 5 on failure), but my workouts did (and honestly still do) take 2 hours. I progressed though, so it might have been for the best that I sticked to 5x5. 5×5 doesn’t work forever. Nothing does. The stronger you get, the heavier the weights you can lift, and thus the bigger the stress of each 5×5 workout. That stress eventually becomes too big for your body to recover from by the next workout. You don’t get stronger in time so you fail reps.
And that was exactly the situation in September, in fact it had been for some time (at least one month). I was feeling physically quite tired a lot of the time. Not really like brain fog, but much more like I'd been doing hard manual labor all day. Switching to 3x5 helped, but I took it further, and since two weeks I'm only doing two workouts a week instead of three. With three workouts I was feeling I really didn't have enough time to recover and consolidate my gains — especially when there was only one resting day in between workouts, and especially on the squat which is done on every workout. I'm feeling pretty good about this right now (not to mention the time savings), but we'll see how it works out in the long run. At some point, I really realized I needed to eat more to be able to progress. After some experiments, I've settled on taking bigger dinners (which were usually lighter for me), as well as occasionally indulging in some more proteins at lunch. I also try to be more consistently taking protein shakes twice a day. Speaking about protein shakes, I've switched to Optimum Nutrition Gold Standard Whey, double chocolate flavor, after a friend recommended it to me. I mix that with milk, and the result is that it tastes a bit like milk with cocoa powder. Finally, proteins that don't taste FOUL. Thanks god. Something disappointing regarding nutrition is that since I started lifting, it seems like my body fat percentage didn't really move. I didn't measure it with any precision, but while it's clear I have more muscles, it isn't clear at all that I have less fat. This is annoying, because my primary objective was to look better... I've drifted from that somewhat (discussion in the next section) but it would be cool if I could do something about it without jeopardizing muscle gains too much. My current idea is to try some form of intermittent fasting (IF). I almost already do an 8/16 IF split where I eat only during at 8 hour window (12:00-20:00), but I'm not being strict about it — I usually have some fruits or nuts in the morning, dessert in the evening, and protein shakes of course. I want to try being extra strict and see if it enables some fat loss. If that doesn't work, I might try another of IF, which I'll refer to as "day fasting": fast one or more whole day in the week. Some popular approaches are alternate-day fasting (but that's too much while doing the gym) and Leangains (twice a week + additional dietetic advice). I'd just do a single day with no more constraints honestly. And if that does not work, I guess I'll need to revert to theh good old "cut": losing fat while preventing muscle loss. Apparently it's much harder to gain muscle than to prevent the loss of already existing muscle. During the period where I was feeling very tired, I started noticing a few effects that would definitely help my gym performance. Having some caffeine in the morning, and some light breakfast (e.g. a fruit and a toast) before lifting helped somewhat. Lifting in the afternoon rather than in the morning helped more (and I'm now usually lifting Wednesday and Sunday afternoon). But most of all, a good night sleep was necessary: a short night of sleep would ruin my chances at breaking through a plateau. I've started tracking my sleep using the sonar tech of the application Sleep as Android. From my research on the topic, the tracking of sleep phases doesn't really seem to be accurate. However, using the app has been an effective incentive to get my average time in bed to 8 hours / night over the past month. I did an experience a couple years ago — while writing my master thesis — where I would not set any alarm clock and sleep as long as my body would require for a few months. The results was that after a brief adjustment period where I sleeped A LOT, I ended up sleeping 9 hours every night. Which is still a lot more than most people get. This doesn't seem to have changed (or maybe has worsened), as even when I sleep 8.5 hours, I never wake up naturally but always from my alarm clock. I'm hoping I can try to increase my sleep even further, since apparently that's what I need. It seems to help the lifting anyhow, at least when combined with the switch to a twice-a-week rythm. In my last post, I set some objectives after which to re-evaluate my training regimen. Namely: 96kg on squat, 72kg on bench press, 120kg on deadlift and 48kg on overhead press. I've blown past all of those, and haven't changed. One reason is "don't change something that works" and the program kept working for me. However, one of my initial objectives was to look better. And I did look better when I wrote last post compared to two months prior, and I do look even better now. But it's a quite subtle improvement for the amount of work put in. The problem is two-fold: first, I have too much fat and that hinders muscle definition; second, I experience relatively little muscle hypertrophy (my muscles are strong, but not that big). There are well-known easy solutions for those things: go into a cut to get rid of the fat (cf. last section) and switch to a hypertrophy/bodybuilding program for muscle growth. The thing is... I have some aversion to switching from the path delineated by the program and its advanced versions. One reason might be familiarity/change-aversion. Another is that I really enjoy constantly beating my records and seeing the numbers go up. I'm also quite curious. How far can I go? If I stop on the strength training path, will I ever be able to come back and see? Doubtful. I guess I could alternate hypertrophy and strength training, at least experiment to see if it's a viable strategy. But I'm still progressing with the current strategy, and it has well-defined changes to implement in case I stall anyway (go to 3x5 than 3x3, switch to Madcow, switch to StrongLifts advanced, switch to 5/3/1). The trade-off outlined before me is simple: risk being unoptimal — maybe I would look better and be stronger faster if I alternated hypertrophy with strength training; or risk completely wasting my time and jeopardize my motivation — if I blow the hypertrophy approach or it doesn't end up being beneficial for my strength. For now I'm staying on the straigth and narrow, but I'm open to re-evaluate when the time comes.